These free tournaments, featuring top-of-the-line gadgets and a luxurious trip are ending soon. Play them now to include your name in the drawings for a chance to win! The SkyCaddie SGX Challenge (ends Mar. 31) - 5 winners by random drawing get a new SkyCaddie SGX Rangefinder! See rules for details. The Visit Edgewood Tahoe Challenge (ends Apr. 30) - Win a trip of a lifetime for two to beautiful Lake Tahoe and stay at Edgewood-Tahoe's exlusive Twin Pines Cabin, located on the lake! See rules for details. The front 9 holes of St Andrews are now available for stroke play rounds. Play the historic course from tee to green in practice, ranked, multiplayer, and match play rounds. The fairways and greens are a lot more firm so be ready to play links-style. The course will also be featured in stroke play tournaments starting March 1. To accommodate the larger greens on St Andrews, all putters have been modified to enable a 300ft swing meter. Be sure to familiarize yourself with this increased range as it offers you more flexibility and options when putting on each course. Have fun on the course! New 2010 TaylorMade R9 Irons (pro +) – more precise than ever! The 2010 TaylorMade R9 iron features a classic look and shape that appeals to players of all levels. The Velocity Control Chamber delivers a significant increase in ball speed to promote greater distance. Optimized Inverted Cone Technology increases ball speed on off-center hits for maximum distance and control. These features contribute to the longest and and most precise iron ever for Pros. 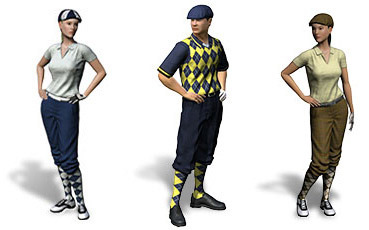 For the perfect outfit to play St Andrews, check out our new avatars featuring plus fours and ivy caps! The hole location status for ready-go tournaments should no longer all say "Easy". The correct value (Easy, Medium, or Hard) should appear now. The score card should no longer be counting putts from the fringe. You should be able to see the putting grid again for putts that are 150ft or longer. If you start a ready-go tournament and it ends before you complete it, you should no longer be stuck in "tourney mode" state. The "standard" green speed has been fixed to perform as expected. The putting elevation is displayed in inches when the distance is less than 2 ft.
* Note: you may find some avatar positioning problems on the first hole of St Andrews if you hit a ball into the water in front of the green. In some cases your avatar may appear to be standing over the water. We are working on a fix, and if you see this problem in the meantime please right-click and submit a bug report to us. Heads up! WGT.com will be unavailable starting at 11PM tonight, 2/24 for scheduled maintenance. The downtime is expected to last approximately four hours. A list of the changes will be posted after the site is back up. Ian Poulter made quite a splash in January '08 when he told press assembled in Dubai that he had an honest belief that it should just be he and Tiger Woods atop the Official World Golf Rankings. "Can I get to number one in the world? No, I can't really, not while Tiger is playing golf," he said. "Can I get to number two, yeah." Well, it only took approximately two years longer than Poulter predicted, but he's finally number two. I mean, he's number five in this week's Official World Golf Ranking. He has approximately half the points that Woods does now. (In fact, Woods has probably lost more points than Poulter has gained. )Kudos for that. But his impressive run through the WGC Accenture Match Play field and final round win over Paul Casey still had him playing second fiddle to Tiger Woods' prepared 13 minute statement that was read two days prior. Even when Woods is not playing golf, he still dominates attention for the sport. In fact, I'm sure we'll see some witty questioning of Poulter's win provided Woods' absence.This would be in contrast to Geoff Ogilvy, whose win here last year with Woods in the field and on the comeback trail, earned him enough praise to practically catapult him to the second ranking in public view. The trick for Poulter is being able to back up his first WGC and US win with more than talk, pink pants, and apparently the Cobra shoot that he did this morning (in fact, going on right now). Did you know that you can access the USGA's "Rules of Golf" and "Decisions on the Rules of Golf" directly on your mobile device? The 2010-2011 app is now available for your iPhone, Blackberry, or Android device, and costs $3.99. 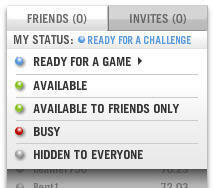 Features include keyword search, simple navigation, and jump dial for quick access to specific rules. Get yours today! 24 Hour Sale - Get 15% More Credits! Start your weekend with a 24-hour sale! When you purchase WGT credits anytime between noon Feb 19 and noon Feb 20 Pacific Time, you will get an extra 15% as a bonus. That means for every $1 you spend, you will get 115 credits instead of 100. Use your WGT credits to upgrade equipment in the Pro Shop, enter premium tournaments, or challenge other players in match play games. With an ever-growing array of equipment in the Pro Shop and higher stakes in match play games, credits are the best way to get the most out of your WGT experience. Hurry, this offer is valid only between 12PM Feb 19 and 12PM Feb 20 Pacific Time. The LPGA season is underway at the Honda PTT LPGA Thailand. Forty-nine of the top 50 on the 2009 LPGA money list will tee it up at Siam Country Club outside of Bangkok, Thailand. World No. 1 Lorena Ochoa is the defending champion. Although last year was tumultuous for the LPGA Tour, a new season and new commissioner had three of the LPGA's biggest stars in a sunny mood as they sat for a press conference on Tuesday. Asked about LPGA commish Michael Whan and new sponsor announcements in recent weeks, Ochoa said, "We are all happy with the new commissioner. We're going in the right direction." Paula Creamer said, "His vision for our Tour is where it should be." Michelle Wie made it unanimous. "I've talked to Mike Whan and he's awesome. He sends e-mails to us and keeps in touch. He wants to know what we're thinking as players." What the players think definitely matters. Just ask ex-LPGA commissioner Carolyn Bivens. It's early, but so far Whan's collaborative style is winning the players and a few new sponsors. The three players also talked about their prospects as the season begins. Creamer, who suffered last year with a mysterious ailment, said she feels the best she has in a long time. Wie said she and other players are gunning for Ochoa's top spot. Lorena said she is just trying to concentrate on her own game and not be concerned about all the great talent chasing her, including last year's rookie of the year, Jiyai Shin. Whether they're in for another bumpy season or not, look for the ladies to hang tough. The LPGA has survived since 1950 when a group of 13 women that included Babe Zaharias, Louise Suggs and Betty Jameson founded the ladies tour. They'll be celebrating their 60th anniversary all year, which will include historic snapshots at LPGA.com. Borrowing a phrase from Spock, who might be a commissioner candidate if Whan doesn't work out, may the LPGA live long and prosper. Some of you have made Pro or Master, gotten new Pro-tier or Master-tier clubs to celebrate, and then found that you could not use them in certain tournaments. This is because the game has a built-in rule that prevents you from playing in a tournament with higher level clubs if you signed up for that tournament while at a lower tier. For example, if you signed up for a tournament as a Pro, but before the tournament ends you achieved Master and bought Master-level clubs, you will not be able to play that tournament with your new clubs. You should be able to play any new tournaments you sign up for with those new clubs. This rule helps to keep the playing field level as players get better and advance tiers. We found the perfect photo to meld together Valentine's Day and Chinese New Year. Hope you are enjoying your weekend! Happy Friday everyone, and enjoy the long weekend!